We’ve been here for over a week, and it has been both exhausting and exhilarating! The children are very bright, energetic, and sweet, if a bit unruly! It appears they have been largely taught by rote, so they don’t understand accidentals, subdivision, time signatures, etc. This makes for a rather difficult task regarding teaching them chamber music and having them play in orchestra. The Colby students have been exceptional, spending lots of time with them. The Ashram students grab their hands, hug them, and generally shower them with affection. 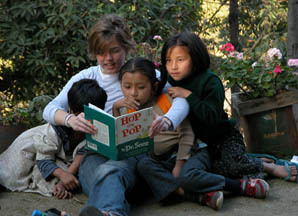 Colby student reading with Gandhi Ashram friends. I only wish I had brought my standardized sight-reading tests with me to confirm what I know to be true! More about this at the bottom of the page under “My Thoughts”. 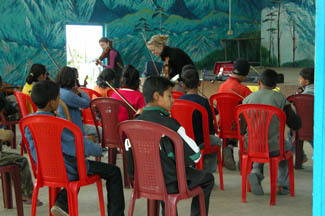 Two of my students are teaching violin technique classes to Gandhi Ashram students in grades 3-8. L & E teaching violin class. 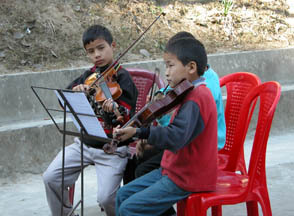 Here are two younger students practicing outside. 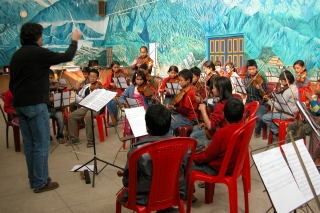 In addition, I’m coaching a string quartet who will play on the concert with us when we return to Delhi. 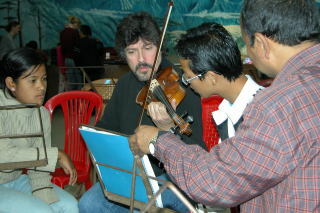 An impromptu lesson following an orchestra rehearsal. The gentleman in the foreground is the year-round orchestra director, R.
performs for the students. Here I am playing some “Morning Bach”. So, now I have experienced world-wide the decline of the teaching (and general knowledge) of western classical music, along with its basis of the written note. Many other types of music in the world are disseminated and perpetuated by ear (the oral tradition). In my study of East African music, some writers were concerned that the inability to properly notate this music might lead to a gradual death (especially in light of the acculturation brought about by western popular music, film and television). Some music scholars have invented elaborate notation systems in an attempt to preserve this music in written form. In fact, I am afraid that Western Classical music will pre-decease music of the oral tradition. I fear (and have more than a strong suspicion) there are hundreds of microcosms in school districts across the United States, where various forms of fiddling have overshadowed the classical tradition. I will not demean this method of getting children to play the violin quickly (mostly by rote), because I feel this is a very important component of how we learn to play an instrument as difficult as the violin. For me, rote learning is a starting point, or a point of departure, from which must follow the inclusion of note-reading, study of classical works and the teaching of a secure foundational violin technique. The”standard” violin technique in the U.S. (in my estimation) that allows students to navigate more complicated works, and to cultivate a sound that can be used as an expressive tool, is the Galamian technique. The problem, as I see it, is the “dumbing” down of violin teaching and playing in order to enable young students to “perform” recognizable pieces quickly and easily for their parents and family. 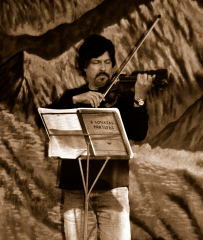 If note reading and proper technique are not taught concurrently, more complex music becomes too difficult and the student becomes frustrated and no longer finds joy in the violin. Hence, classical music becomes unattainable, and is therefore classified by the young student as boring. These young students may not want to confess to themselves and others that this music is simply beyond their ability to understand. One certainly needs to understand the music one is performing on some level, or nothing is communicated to the listener. “Green Eggs and Ham” was my favorite, along with “One Fish, Two Fish, Red Fish, Blue Fish”! Glad you like the photos! I just added some more. Graybert, I love the photo of you and your “Morning Bach”! Glad to hear things are going so well! The pictures are FABULOUS and I am really enjoying them. We’re back! I’m glad you’ve been enjoying the photos. I’ve got hundreds more to show you, if you like. Dear G, Bravo on your essay “My thoughts”! It’s about time parents of America are told what’s happening in music departments in many of their public schools, as well as worldwide! Especially where string instruments are concerned. I believe public education leaders really do want music & violinists in their curriculum; but they were not trained in that area. Only if they hire a music/violin teacher lavishly educated in the classical school, with it’s complex nature and brain developing characteristics, will the students experience the bounty of classical music and “foundational violin technique”. Their adult years will be richer for it. P.S. It’s “green” for the world too! Thanks for your kind comments. I’m glad you enjoyed my “Morning Bach” as much as I enjoyed playing for you! I hope we can return to the Gandhi Ashram school next year. 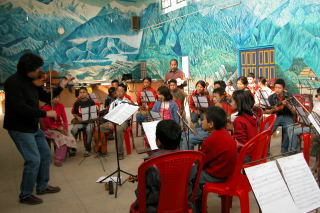 We had an unforgettable time in January 2008 and would love to see all the wonderful students again. Please send warm regards from us to everyone at the Ashram! i am a student from GAS and i too play violin like everyone at school. i am studying violin in the music university in Germany since two years. i just loved to read your essays. i am so happy that you liked GAS. I’m glad you enjoyed reading my essays. My wife and I had a wonderful experience with the students at the Gandhi Ashram School. Were you a student at the school then (January 2008)? Where are you studying in Germany? Best wishes as you continue your violin studies.